Doing the history on Uptowns. There are few sneaker models out there that have been more celebrated than the Nike Air Force 1. The shoe has been the subject of numerous campaigns from Nike, as well tributes from footwear enthusiasts who recognize the power of the classic Nike Basketball silhouette. Delving into the model's rich history once more is the documentary below, spotted by Gary Warnett. 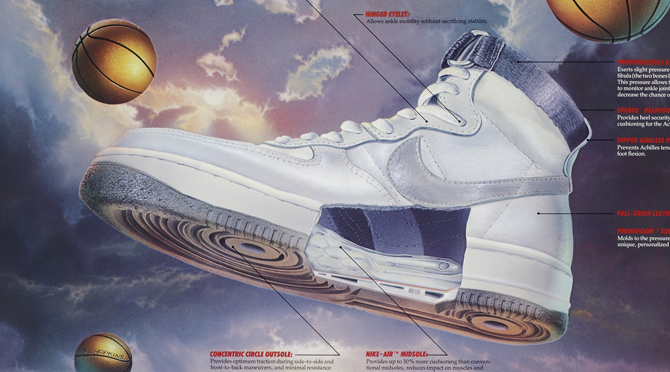 The movie, titled Air Force 1: Anatomy of an Urban Legend, came out back in 2012 as a Nike promo piece, and was screened at the brand's World Basketball Festival celebrations, but hasn't been seen since. The piece features appearance by Swoosh legends like Sandy Bodecker and Bruce Kilgore, some light shed on the shoe's drug dealer connections, and more bits that better tell the story of the AF1's cultural significance.